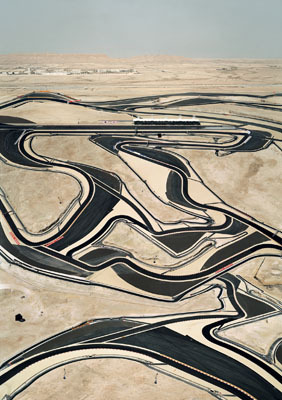 Andreas Gursky, Bahrain I, 2005, c-print, 117 11/16 x 84 5/8". Among the exceptional group of students who cut their teeth during the 1980s in Bernd and Hilla Becher’s master class at the Düsseldorf Kunstakademie, Andreas Gursky made it biggest, literally. His oversize, digitally manipulated images of postmodern spectacle update his mentors’ program of dispassionately archiving sites of modernist production, and argue, in both form and content, that global capitalism not only generates industrial objects but images, representations, and subjectivities as well. Given how his works address the circulation of images in a global economy, it makes perfect sense that this exhibition—curated by Thomas Weski—of some fifty large-scale photographs, mostly from the past six years, will embark on its own world tour. Travels to Istanbul Modern, May–Aug., Sharjah Art Museum, United Arab Emirates, Nov.; Moscow House of Photography, spring 2008; and other venues.